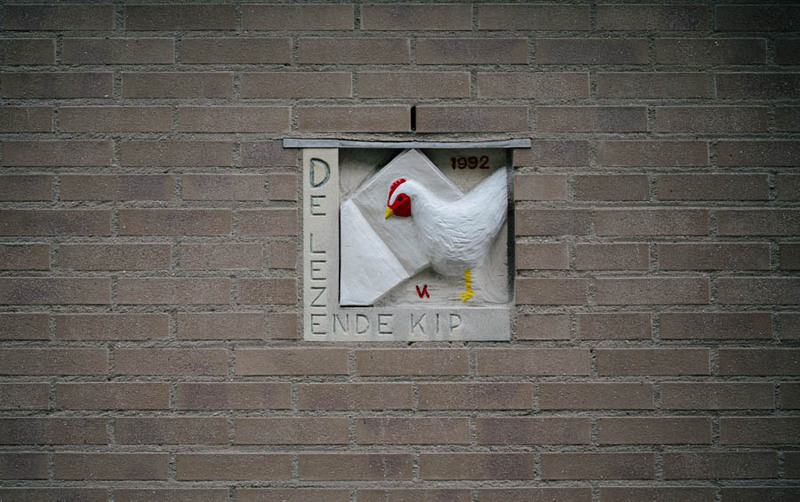 While walking through a quiet neighbourhood in Amsterdam today, I came across this gable stone depicting a rooster reading a book. This being a warm afternoon, the French window on the first floor of the house bearing this gable stone was ajar. Just as I was about to walk off, the window opened. A kindly, bespectacled man - probably in his late 70s, looked out, noticed me, and asked me if I knew English. I answered in affirmative but I wasn’t sure where this conversation was going to lead. I began to prepare myself for being admonished for having taken the picture. Not that anything like this has ever happened, but I can see that some people might get touchy about tourists going around taking pictures in a quite street. The man said, and I paraphrase, that back in the day when houses didn’t have numbers, you could get directions to the right house by using these gable stones. Like “walk past two houses after so and so gable stone and you’ll reach my house”. Here comes the spiel about privacy - I thought to myself. But I was so wrong. He then mentioned that his father was really into books and his girlfriend’s father a merchant. Both the fathers put in a little bit of money to help them build this house. So when the house was ready in 1992, to commemorate their contributions, he got this gable stone commissioned. “Why the chicken?” I asked. I thanked the man sincerely for sharing this bit of private history. The gable stone would definitely not be the same without it. This city never fails to surprise.